In comparison with other types of mechanical housing which rust in high humidity, the stainless chassis displays are anti-corrosive. 3mm thick glass can be added to make it vandal-proof. Stainless chassis can be used in many applications such as museums, shopping centers, halls, schools, and venues requiring direction, guidance, and information. Stainless LCD features an ultra-compact mechanical design, providing extra robust structure for severe environment and no need of painting for surface protection. Winmate Full IP65 Rugged Series is designed with high performance features. Water and dust protection enables clients to use our products in harsh environments such as the swimming pool, harbour and open public locations. 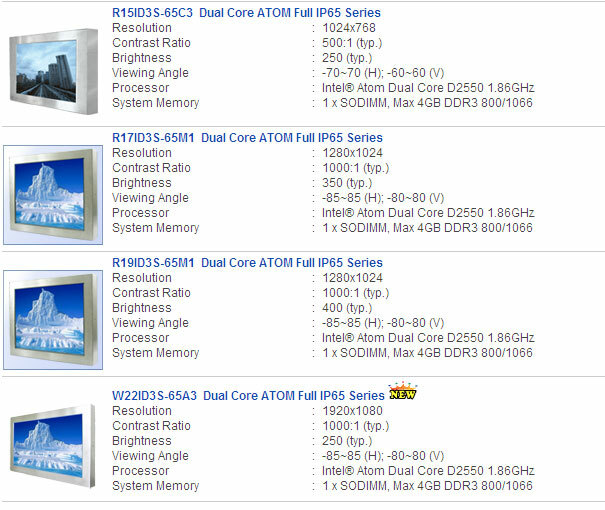 In addition, this series equipted Atom D2550 dual core CPU 1.86GHz single board computer. It combines with a TFT LCD Panel (15" ~ W22") and offers a compact design to meet the demanding performance requirements of harsh environment applications.